Why do birds seem to prefer the letter V? Have you ever looked up in the sky to see a “V” soaring above your head? No, not a flying alphabet — a flock of birds in formation! Let's try to find out. Birds of the same feather flock together! “In the fall, when you see geese heading south for the winter fly along in V-formation, one might consider what science has discovered as to why geese fly this way. Each bird flaps its wings creating uplift for the bird immediately following. A flock has a greater flying range in formation than a single bird would have on its own. When a goose falls out of formation, it feels the drag and resistance of trying to fly alone and quickly rejoins the formation. The goose takes advantage of the lifting power of the bird in front. The geese in formation honk from behind to encourage those flying up front to keep their speed. 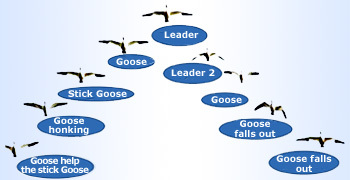 When a goose gets sick or wounded and falls out of formation, two other geese will fall out of formation with that goose to follow it down to lend help and protection. They stay with that fallen goose until it is able to fly or it dies. Only then do they launch out on their own or with another formation to catch up with their flock. People, who share a common direction and sense of community, can reach a goal more quickly and easily because they are traveling on the thrust of one another. It is harder to do something alone than together. It is beneficial to take turns doing demanding work. By sharing leadership and depending upon others in a group, there is a chance to lead and an opportunity to rest.” --- Anon. Ducks flying in V shape. Group of birds will typically fly in a large “V” shape with one bird in the lead and others trailing behind in two lines. The large groups of birds are particularly common in late autumn and early winter when birds migrate from their summer habitat in Canada to the warmer climate of the southern United States. Such groups of birds will typically fly in a large “V” shape with one bird in the lead and others trailing behind in two lines. It is particularly difficult for human pilots to master 'formation flight': it takes years of practising to demonstrate the touch-and-go maneuvers that you might have witnessed during air shows. But for migrating bird that&apos;s a piece of cake. 65%of birds species do migrate. The reason why geese, ducks, swans, pelicans or cranes fly in a V–shape has puzzled researchers for long. Difference in pressure creates the lift. 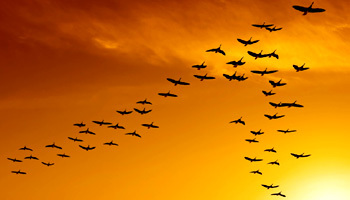 Birds save energy when flying in V-formations. Why birds fly in a V-formation? Scientists who have studied formation flight believe that birds fly in this way for two reasons. The first reason is that the shape of the formation reduces the drag force that each bird experiences compared to if it were flying alone. This decrease in drag occurs due to the formation of wingtip vortices. Vortices form because of the difference in pressure between the upper and lower surfaces of a wing that is operating at a positive lift. A wing generates lift because there is a lower pressure on its upper surface than on its lower surface. This difference in pressure creates lift, but the penalty is that the higher pressure flow beneath the wing tries to flow around the wingtip to the lower pressure region above the wing. This motion creates what is called a wingtip vortex. As the wing moves forward, this vortex remains, and therefore trails behind the wing. For this reason, the vortex is usually referred to as a trailing vortex. One trailing vortex is created off each wingtip, and they spin in opposite directions. Up-wash and down-wash As a bird flaps, a rotating vortex of air rolls off each of its wingtips. These vortices mean that the air immediately behind the bird gets constantly pushed downwards (down-wash), and the air behind it and off to the sides gets pushed upwards (up-wash). While trailing vortices are the price one must pay for generating lift, their primary effect is to deflect the flow behind the wing downward. This induced component of velocity is called down–wash, and it reduces the amount of lift produced by the wing. In order to make up for that lost lift, the wing must go to a higher angle of attack, and this increase in angle of attack increases the drag generated by the wing. We call this form of drag as induced drag because it is “induced” by the process of creating lift. 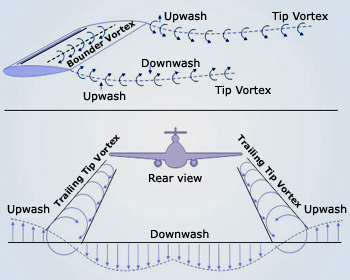 These vortices are generally undesirable because they create a down–wash that increases the induced drag on a wing in flight. However, this down–wash is also accompanied by an up–wash that can be beneficial to a second wing flying behind and slightly above the first. The tip vortices cause additional down–wash (or down–flow) behind the wing within the wingspan. 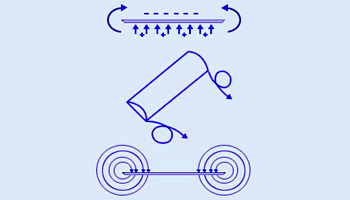 For an observer fixed in the air, all the air within the vortex system is moving downward whereas all the air outside the vortex system is moving upward. A bird flying perpendicular to the flight path of another bird creating the vortex pattern will encounter up–wash, down–wash, and up–wash in that order. The gradient, or change of down-wash to up–wash, can become very large at the tip vortices. Heart beat rate of a flying bird If bird in a flock flies in either of the upwash zones, it gets free lift. It can save energy by mooching off the air flow created by its flock-mate. Due to this, birds at the back of the V had slower heart rates than those in the front, and flapped less often. A bird flying in one of these up–wash regions essentially gains free lift so that it can fly at a lower angle of attack. As angle of attack is reduced, the induced drag is also lowered so that the bird does not need to flap its wings as hard or as often to generate the thrust needed for forward flight. Flapping the wings less often means that the bird&apos;s muscles do not work as hard and its heart rate drops. 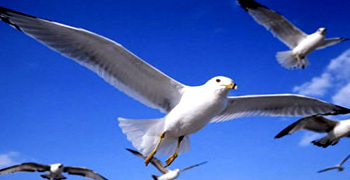 As a result, the bird does not tire as quickly and is able to fly farther. Researchers explored this theory by monitoring pelican heartbeats during flight. 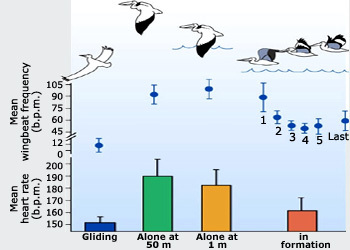 Examination of the data showed that the heart rates of pelicans flying in formation were much lower than that of a bird flying alone. As each bird flaps its wings, the trail of upwash left by its wingtips also moves up and down. The birds behind can somehow sense this and adjust their own flapping to keep their own wings within this moving zone of free lift. Other studies have estimated that a flock of 25 birds in formation can fly as much as 70% further than a solo bird using the same amount of energy. By spacing themselves apart properly, birds can achieve optimum positions that reduce the drag of every bird in the formation. However, not all birds benefit equally. Teamwork in V-formation Cyclical rearrangement gives all birds the responsibility of being the leader as well as a chance to enjoy the maximum benefits of being in the middle of the formation. The lead bird has to work the hardest since it flies into undisturbed air. The up–wash that this bird creates improves the aerodynamics of the two behind it, and these two further improve conditions for the next two birds in line. When the lead bird is tired, it will drop out of the lead position and fall further back into one of the lines of the V. Another bird from further back will rapidly move forward to take the leading position and maintain the formation. The two birds in the furthest trailing positions also tire more rapidly than those in the middle, so these positions are also rotated frequently to spread the most fatiguing locations throughout the flock. This cyclical rearrangement gives all birds the responsibility of being the leader as well as a chance to enjoy the maximum benefits of being in the middle of the formation. This sense of teamwork comes naturally since even the youngest members of the flock rapidly realize that it takes less work to fly in a V-formation than it does to fly alone. Communication between birds V-formation provides good visual contact and minimizes possibility of losing birds along the way. A second reason that may explain why birds fly in V-formation is that this orientation allows the birds to communicate more easily. The V-formation provides the birds with good visual contact of each other to keep the flock together. This communication minimizes the possibility of losing birds along the way as the formation crosses vast distances during migration. This demonstrates how team work plays a very important and useful role in nature. We need to not only work together but support each other to achieve a common goal. Also, working as a team, encouraging and supporting each other lets us accomplish amazing goals with much less effort. “No man is an island”, and we do need each other for the human race to exist. All of us have a role to play in society and the world at large – “All for one and one for all”. Fighter aircrafts Copying birds may save aircraft fuel! It is important to note also that military jets fly in this V-formation for the same reasons. Each fighter pilot can see, communicate and help each other while in flight working as a team. Although manned aircraft can also exploit the benefits of formation flight, it is difficult to do so since we still lag behind nature in the ability of our technology to “feel” the air and adapt to it for optimum performance. Close formation flight among a group of aircraft is often difficult to maintain because of the turbulence created by the lead aircraft. Perhaps one day we will be able to develop advanced technologies that make aircraft as sensitive to their surroundings as the body of a bird is today. We may then be able to make better use of formation flight to improve the efficiency of flying vehicles. However, military planes do still operate in V-formations, but they are typically spaced too far apart to enjoy the benefits of reduced drag. These aircraft instead fly in formation primarily to maintain visibility of all the aircraft in the squadron in the same way that birds do.